New book, 362 pages. 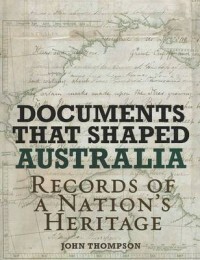 Documents that shaped Australia is a richly varied anthology of 100 written and spoken snapshots of the Australian nation across space and time. John Thompson's diverse selection - illustrated with facsimile documents, portraits and maps and featuring detailed contextual introductions - spans over 400 years of recorded Australian history, drawing on letters and diary entries, poems and songs, as well as official commissions, petitions, speeches and acts of Parliament. This collection of touchstones from the nation's documentary heritage reveals Australia's moments of triumph and its hopes for a richer and better future. Beginning with the first reported sighting of the Southern Cross constellation in 1516 and concluding with Prime Minister Kevin Rudd's national apology to the Stolen Generation in 2008. This item was added to our catalog on Monday 28 June, 2010.